BIRKEMEIER NURSERY LLC still has some trees available for sale for this planting season. I have #1 Bare-root WEPSTER , YAMHILL and JEFFERSON with pollinizers THETA, ETA AND FELIX. I have a limited number of MCDONALD in 1 gallon pots still available. I do have #2 trees available in all varieties except York..
A #1 tree has a minimum planting height of 32″. A #2 tree either has rooting on just 2 sides or is between 26 and 32 inches.. Get them while you can. Ask around, we have great trees! Trees are all dug and ready to pick up now. Feel free to give me a call at 503-313-1368 or email Nancy@BirkemeierFarms.com for more information. We ask that all trees be picked up from our tree lot by February. New stools in our Nursery. It’s not too late to pre-order your trees for next planting season. I have most varieties available for 2019 / 20 delivery. We request a non-refundable deposit of $1 per tree to confirm your order that we will collect at the end of this year. I am quickly selling out of McDonald and Yamhill. 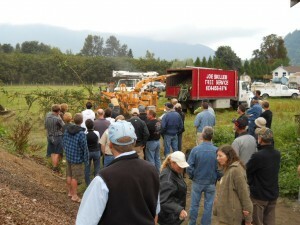 Fall of 2014 Dr. Shawn Mehlenbacher made a video about the Hazelnut Breeding Program. It was just released. Short and Sweet and very well done. 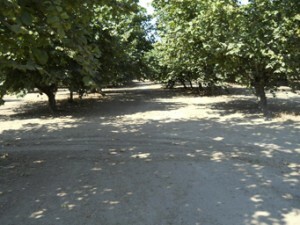 During the month of August, we prepare the Filbert orchard floor for harvesting the hazelnuts. All season we have been spraying out the weeds and suckers in the tree rows, so they are pretty much clean at this point. We take one last time through with sucker spray just before the nuts fall. This year we made a tire drag (see photo) to pull between our trees to break up dirt clods and knock down mole hills in the tree row. This is pulled by the quad or gator. We are removing trees in the orchard (10X20 spacing) as they get seriously sick from EFB, so we have open spaces in our close planted orchards. These spaces are also smoothed with our tire drag. This allows the blower on the sweeper to move the nuts in the tree row more effectively. We have also been scraping the alleyway between the tree rows. The idea is to get it as clean and flat as possible. This makes fewer dips for the hazelnuts to lay in and be missed by the harvester. We go through the orchards between 3 and 6 times with our scraper in the 6 weeks before the nuts fall. 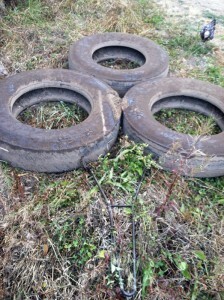 3 large truck tires bolted together with back plates, pulled between the close planted trees. The orchard floor ready for nut fall. 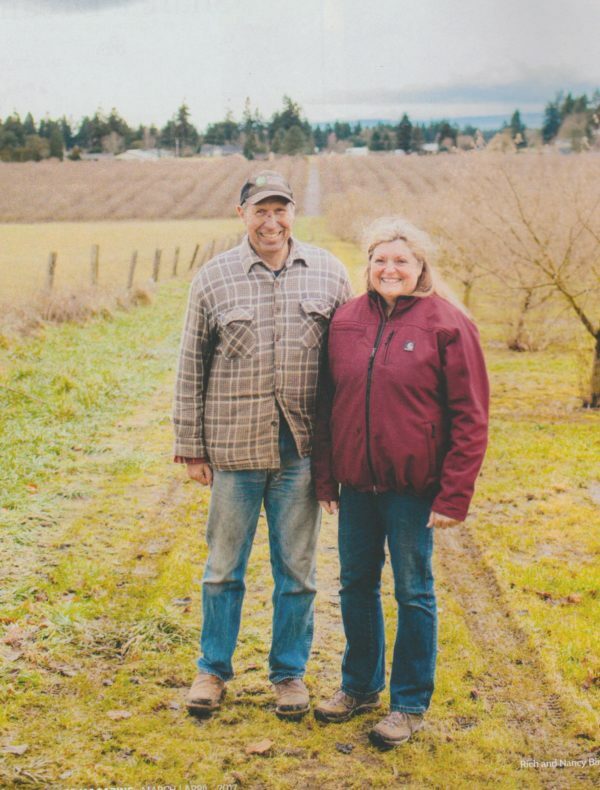 Rich Birkemeier and Ben Mitchell, hosted by Willamette Hazelnut Growers, Inc. conducted our 4th New Grower’s and Planting Forum on Saturday, Sept. 8. 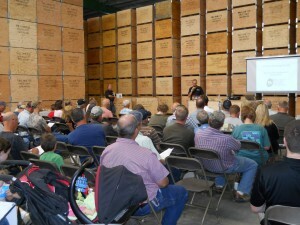 We had over 70 in attendance, many whom indicated they were new to the hazelnut industry. Michael Severeid, Sales Manager for WHG, gave a brief presentation on his recent sales trip to China. He had slides of the hazelnuts grown in China and many samples of hazelnuts marketed in China. Rich and Ben presented information on varieties, spacing, blight and new plantings. Pizza, veggies and cookies were served at lunchtime. Ben took those interested into the field to see blight in Jefferson and a pruning demonstration for new plantings. The feedback was great. We decided it was much warmer to hold our meeting in September than November. The weather was beautiful. If you are interested in attending a grower forum with WHG, please contact Michael at Juliana@willamettehazelnuts.com to be put on the notification list. We have conducted these forums in the early spring and late fall. As long as we have interest, we will continue to present this information. 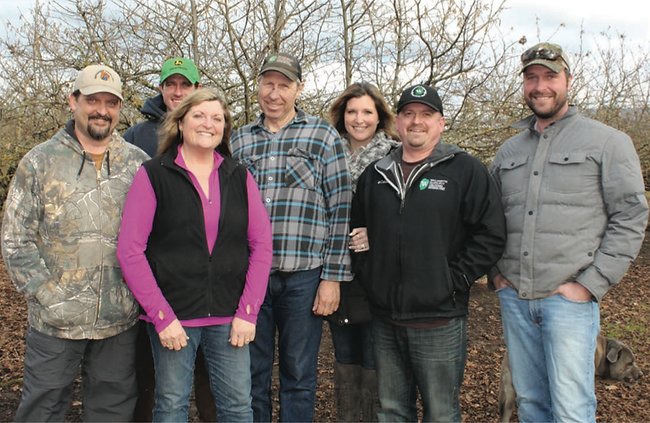 Our goal is to help each and every one of our new hazelnut growers to succeed. 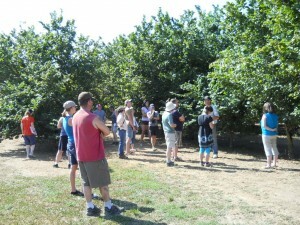 Rich and Nancy had the privilege of attending the British Columbia Hazelnut Tour in Agassi / Chilliwack, B.C. on Aug 23. Pentti and Deborah Hanninen invited us to bunk at their beautiful home, overlooking a mature Barcelona orchard, in Chilliwack. 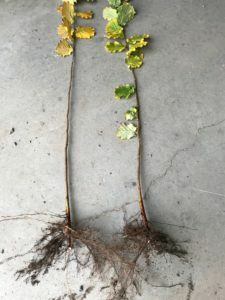 The BC hazelnut growers, about 800 acres total, are facing the same Eastern Filbert Blight issues that have concerned Oregon growers, they are just about 10 years behind us. Due to import restrictions, they are having to start the new varieties in-vitro. They are doing some testing on OSU released varieties to determine pollen shed and bloom timing for their area. All in all, we see an industry that is moving forward. They have blight, in some cases it is pretty serious, but they have the advantage of watching to see how we have handled it in the states, so they are a huge step ahead of where we were in the beginning. 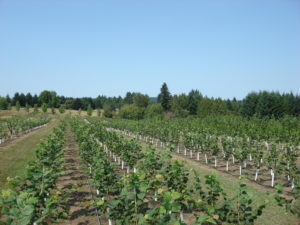 In part, due to very high land prices, most of the hazelnut orchards are small organic farms. Many of the growers have integrated operations from growing to value added products. Their variety of products is impressive – and tasty! The Fraser River Valley is an amazingly beautiful area. The growers, though few in number, are warm, hospitable people. We enjoyed our visit immensely. Chipping demonstration of mature filbert tree infected with Eastern Filbert Blight. 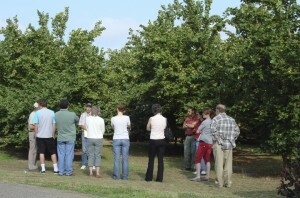 This week we had the honor of being on the tour agenda for the OSU “Discovering Willamette Valley Agriculture” course. This class is offered through Oregon State University and is designed for K-12 educators, county commissioners, state legislators, high school and university students, as well as interested community members with little or no agricultural background. The objective of the course was to learn about agriculture from farmers, what it takes to make a living as a member of a farming family, and the kind of decisions that impact your financial success. We were only one of many farm businesses that were visited. Rich spoke about the history of our farm, the involvement of the members of our family, and the biggest trials and challenges that we face as an agricultural business. We had a beautiful sunny morning to meet in the orchard. Later, we joined the group at St. Josef’s Winery for a very nice lunch.